August 24, 10:00 a.m. and 2:00 p.m. 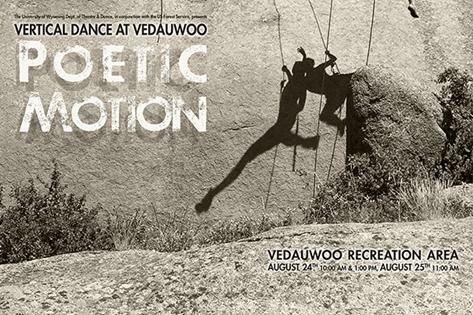 Since 1998, “Vertical Dance at Vedauwoo” has been an end-of-summer favorite with local audiences, with the natural rock formations at Vedauwoo offering a spectacular setting for the dance, which covers the entire performance area and connects the land to the sky. Created by Associate Professor of Theatre and Dance, Margaret Wilson, and Professor of Geology, Neil Humphrey, the site-specific vertical dance choreography features UW students dancing on rocks both near to and far away from the audience. Each new concert at Vedauwoo introduces a theme or storyline. This year, the choreography is inspired by the poems of UW Creative Writing faculty Kate Northrop and Harvey Hix, and the music is being composed and performed by “Lights along the Shore,” a trio consisting of Rod Garnett (nai flute), Blake McGee (bass clarinet) and Lisa Rickard (keyboard/piano) with Steve Barnhart (percussion). The production will be a unique blend of music, spoken word, and movement, with local storyteller, Paul Taylor, presenting the poetry during the performance. PLEASE NOTE: Getting to the “Vertical Dance at Vedauwoo” performances will take additional time, so audience members are advised to leave Laramie at least 70 minutes before the performance they are scheduled to see. The earlier you arrive, the better. In addition, we encourage patrons to carpool to the venue when at all possible, and to please leave pets at home, unless you have purchased a ticket for them. Please note that limited bussing from Laramie will be available for the August 24, 10:00 a.m. performance only for an additional fee. The bus will leave from the Premier Bone and Joint parking lot at 8:35 a.m. on the morning of the performance. Bus capacity is limited and is offered on a first come, first served basis. Bus passes are $3.00 per person and must be purchased from the Performing Arts box office, along with tickets for the 10:00 a.m. performance. Patrons are advised to procure tickets and bus passes by calling 307-766-6666 or by visiting the Fine Arts Box Office weekdays from 10:00 a.m. to 4:00 p.m.
As in the past, bussing will be available onsite to shuttle patrons from the designated parking areas outside the fee area of the Vedauwoo Recreation Area to the venue site near the Box Canyon parking lot. This service is free. The last bus leaves for the venue site 15 minutes before the start of the performance. The trail up to the performance area is a gradual incline and there are loose rocks and low tree limbs along the way. Ushers will be on the trail to help patrons find the seating area. The seating area is first-come, first-served, with seating mainly on the ground. The performance lasts approximately an hour in an area with little or no shade, and is at about 8600’ ft above sea-level. Bright sun and hot temperatures are likely to be balanced with occasional showers. Patrons are advised to plan accordingly. Sunscreen, water, and a blanket to sit on are recommended. Vedauwoo is a natural recreation area and can be challenging terrain. Minimal ADA accommodations are available, and patrons should contact the box office as soon as possible for further information. The vertical dance performances are produced in cooperation with the US Forest Service.